Surviving tenth grade is the least of Cat Colvin’s worries. Cat Colvin wants more than anything to just be an “average” teenager and blend in, but having found out the secret of her adoption has Cat questioning her entire life. Unfortunately, there are much deeper and darker secrets being withheld from her that may prove to threaten her very existence. Cat will be forced to make a choice: stay in Astoria and possibly endanger all that she loves, or flee and hide amongst her kind. Friendships will be tested, family bonds will be tried, and even Cat herself will be pushed to her limits both emotionally and physically; all while trying to maintain a somewhat normal relationship with her boyfriend Ryan. What is actually going on in the quaint port town of Astoria, and are Cat and her loved ones prepared for the dark days that loom ahead? Find out in this continuation to the “*…thrilling, unputdownable story,” The Childe. Just like The Childe, Dark Days was phenomenal!! I loved every second of this second installment. It kept me reading the entire time, and was chalked full of action and adventure. I loved how much more this book went into about Childe's, vampires, and even a couple new paranormals. The characters, i feel, stayed true to themselves from the first book. There wasn't some big change where the shy girl is now all of a sudden the most heroic person of the group, they stayed who they were. There was definitely some growth, but overall it was natural and didn't shock you that that character did that. I love how Cat is so true. She is there for everyone she knows, and is not afraid to put them before herself. And i also thought it was interesting that C.A. Kunz put in two new characters who really make you question their motives the entire time. I loved how much more we learned about Ms. Amaya and Wedgewick Village. Ms. Amaya i think is one of my favorite characters, and i just love learning about the witchcraft aspect of this book. 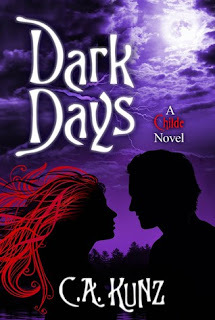 The Childe series has so many different paranormal factors playing in it, and i really like that you really get a feel for all your favorite paranormals, or at least most of them, in one series. Dark Days was REALLY thrilling and it made it that much better, because of it. It really kept me reading, because almost every chapter had some cliffhanger to make you want to read the next one and find out what happened or what is going to happen. You wanted to hurry up and read the scary parts, and take your time through the fight scenes and the thousands of attempts that Cat was almost killed. Dark Days definitely took The Childe in the right direction. Instead of staying on the introduction aspect of the novel, where you are still learning who the characters are and how they play a role in this, it really just dives right in to the story and then puts important character info between the main scenes. I enjoyed this novel JUST as much as the first one and can't wait for the third! C.A. Kunz did an amazing job. They really did an excellent job with where the story was going to go next, and they didn't waste any time. Usually you have to get through the first 50 pages of a novel to get to the good stuff, but this was excellent from page one. I also loved that they didn't try to make their characters have a sudden personality change, but did it gradually where it just felt like growth of that character and that it still felt true to them. Dark Days is a thrilling, action packed novel and i really enjoyed every page of it. I highly, highly, HIGHLY recommend everyone gives this series a read, because it will have you guessing and flipping pages the entire time. I really like your review and I hope I find your books on our campus. This was a very good review,it didn't give any real spoilers,as some do!I love The Childe and I know I'll love Dark Days as well!! What a great review. It makes me want to read Dark Days and The Childe. Thanks for the thumbs up! I enjoyed reading your review. I'm looking forward to reading the book. Thank you for checking it out and i really hope you do get a chance to read them! Thank you =D Yea i try to not include any spoilers in my reviews, especially when its a later book in the series. And yes, if you loved The Childe you will most definitely love Dark Days. Excellent review!!! I just started reading the Childe and I cannot wait to ready Dark Days!!!!! Opps! Read, not ready!! Guess I am too excited! Hehe! The Childe is my favorite of all the books I read this month. Just waiting for some overtime pay, so I can afford Dark Days. Thank you! And im excited for you. How do you like The Childe so far? haha happens to me all the time. This review is great! I can't wait to start reading the book! Who is this reviewers favorite character in this series?